I know that summer is over and all (at least on this side of the planet), but can we please pretend like the sun is out and we’re in tank tops, riding bikes to get ice cream? Or at least can we keep making pretty salads for lunch? I can settle for the latter if you throw in a fireplace (’cause dang, it’s cold outside). This salad was inspired by a sandwich I had when we were in Iceland. I found a juice shop (Jo & The Juice!) that served up sandwiches on GF bread with a pesto-y dressing, fresh tomatoes, and ripe avocado. Swoon. 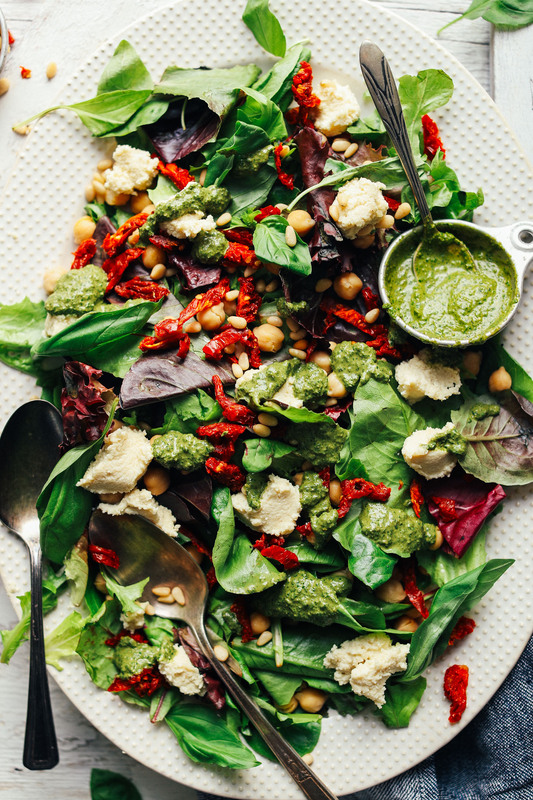 This recipe requires less than 30 minutes to throw together even with the Easy Vegan Pesto dressing and Whipped Almond Ricotta. The only other elements are cooked chickpeas and pine nuts for some plant-based fiber and protein and sun-dried tomatoes for texture and depth of flavor. You could also throw in some avocado, but I didn’t find it necessary. And for more carbs (#carblife), toss in some cooked gluten-free pasta (like this Pea Pesto Pasta Salad!). I hope you all love this easy, bright-and-cheery salad. It’s versatile, flavorful, satisfying, and the perfect lunch or light dinner. 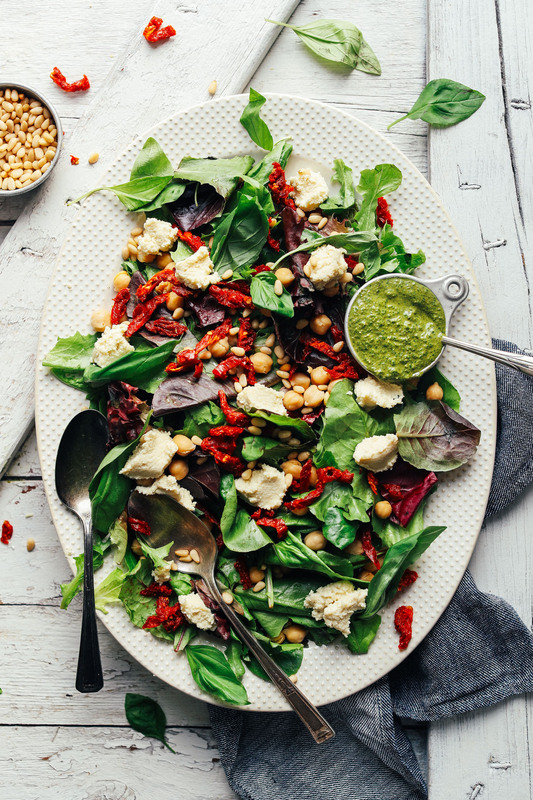 Quick-and-easy salad with mixed greens, almond ricotta, sun-dried tomatoes, pine nuts, chickpeas, and pesto dressing! A 30-minute plant-based meal! Start by preparing Whipped Almond Ricotta (follow link for instructions). Then set in refrigerator until serving. 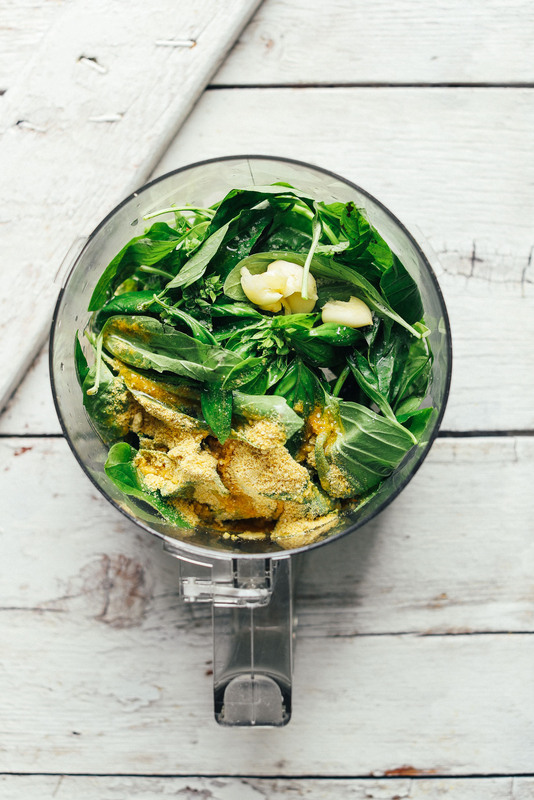 Next prepare Easy Vegan Pesto dressing (follow link for instructions). Then cover and set in refrigerator until serving. 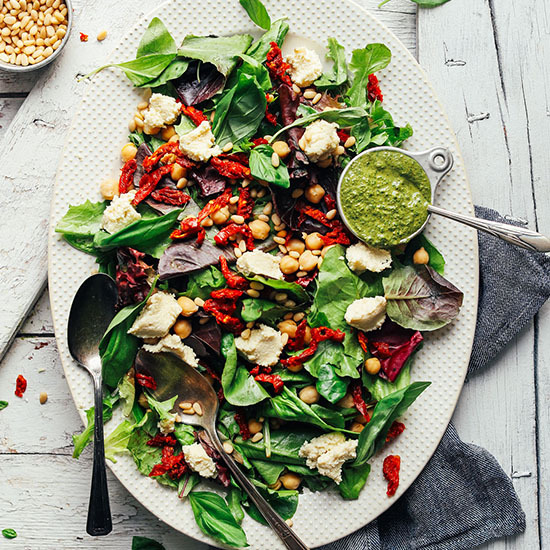 To plate, arrange greens on a serving platter (or bowl) and top with sun-dried tomatoes, pine nuts, and cooked chickpeas. Dollop on spoonfuls of almond ricotta and drizzle with vegan pesto. You can also squeeze with fresh lemon juice (optional) for extra flavor and moisture. Best when fresh. Store leftovers separately (undressed) up to 3 days in the refrigerator. 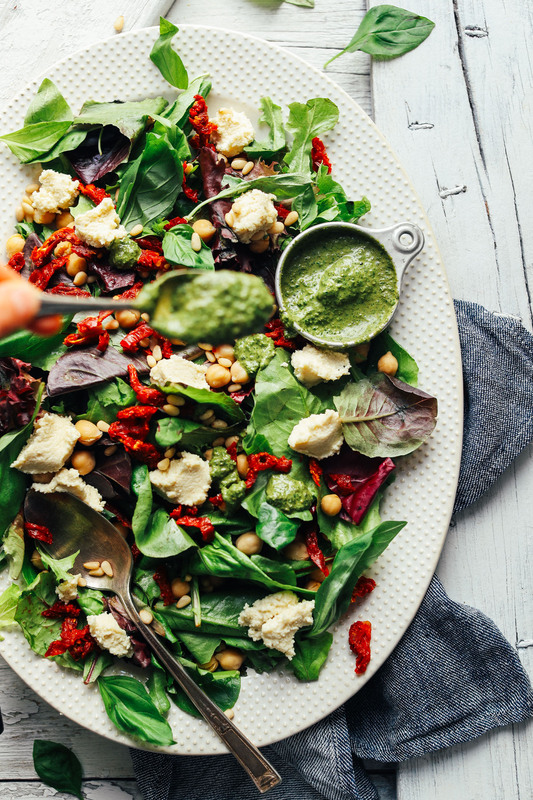 *Nutrition information is a rough estimate calculated with all of the ingredients included (1/2 cup pesto dressing, 3/4 cup almond ricotta). Adults next weekend. :) It’s a big spread for me, and mixed vegan/veg/meat eaters. To save on $ & time, do I buy dairy based ricotta and try that? I’m not so versed in ricotta. Or would you suggest a different cheese? I loved loved loved the recipe! Only note, you might want to include toasting the pine nuts in the directions. I lucked out and my chef girlfriend let me know i needed to do this. Wonderful tasting salad, and I love that the colors are perfectly festive for Christmas! Sun-dried tomatoes and pesto is the best combination!! What a hearty and beautiful salad! Could we swap the pine nuts for any other nuts? Wow, that looks awesome. On another note, I served your Mediterranean Baked Sweet Potatoes for a dinner party Friday & your uncle, who is hard to get vegetables down had seconds & leftovers the next day! My guest loved them also! Oh! The salad looks super awesome! LOVE all the color! The Pesto…YUMMERS, too! WOW! Could the ricotta be baked in pasta shells or would that change the texture /taste to much? Hi Jenn! Yes you can! Looks like I found my Thanksgiving dinner then!